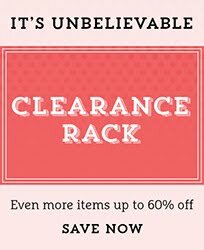 Rubber Room Ramblings: APPLE BLOSSOMS FREE HOSTESS SET FROM STAMPIN' UP! This is one more card that Nancy shared with us at our last demonstrator get together. She was definitely on a roll whippin' those cards out for us to enjoy~~and I loved every minute of it. This card is made with lots of new Stampin' Up! 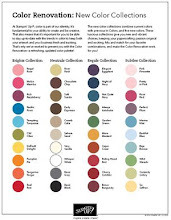 colors: Daffodil Delight, Cherry Cobbler and Early Espresso. 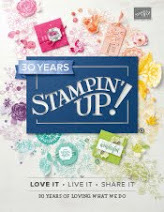 She used the new Stampin' Up! 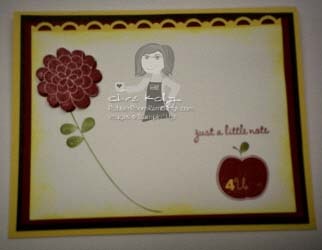 Level Two Hostess Set called Apple Blossoms and the Stampin' Up! Scallop Trim Border Punch. I love the way you can see the Cherry Cobbler behind/underneath the border punch! 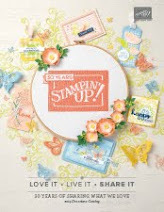 Contact me today to see how you can earn this stamp set for FREE! Thanks again, Nancy for your creative inspiration!